Description: It is one of two species in the genus Azadirachta, and is native to India, Pakistan, and Bangladesh growing in tropical and semi-tropical regions. 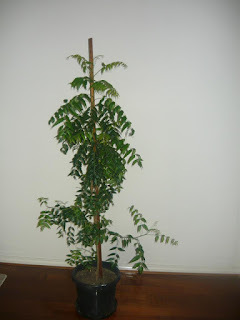 The neem tree is noted for its drought resistance. Normally it thrives in areas with sub-arid to sub-humid conditions. Neem is a life-giving tree, especially for the dry coastal, southern districts of India and Pakistan. It is one of the very few shade-giving trees that thrive in the drought-prone areas. The tender shoots and flowers of the neem tree are eaten as a vegetable in India. A souplike dish called Veppampoo Rasam (Tamil) (translated as "neem flower rasam") made of the flower of neem is prepared in Tamil Nadu. In West Bengal, young neem leaves are fried in oil with tiny pieces of eggplant (brinjal). The dish is called nim begun and is the first item during a Bengali meal that acts as an appetizer. It is eaten with rice. Neem is used in parts of mainland Southeast Asia, particularly in Cambodia, Laos,Thailand, Myanmar and Vietnam. Even lightly cooked, the flavour is quite bitter and is eaten because it is believed to be good for one's health. Kitchen Pharmacy: .Products made from neem trees have been used in India for over two millennia for their medicinal properties. It is an integral part of the ancient herbal medicine system of Ayurveda and Unani medicines. It is believed to to have antibacterial, anti-fungal and anti-viral properties. Considered beneficial in lowering blood sugar, settling indigestion and diarrhea it is also used in reducing gingivitis (gum disease). It has wide application as a natural pesticide and is used by organic farmers in several countries in the world. Before the advent of toothpaste in South Asia, people used the tender twigs of the neem tree as a toothbrush to massage the gums and clean the teeth (called 'datun' in Hindi). Neem oil today is used as a 'health and beauty' ingredient by many Indian brands of cosmetics and personal products. Scientists in the West have also been studying the benefits of neem for years and in fact, this tree became the source of an interesting patent battle some years ago! In 1995, the European Patent Office (EPO) granted a patent on an anti-fungal product derived from neem to the US Department of Agriculture and W. R. Grace and Company. The Indian government challenged the patent when it was granted, claiming that the process for which the patent had been granted had actually been in use in India for over 2,000 years. In 2000, the EPO ruled in India's favour but W. R. Grace appealed, claiming that prior art about the product had never been published in a scientific journal. On 8 March 2005, that appeal was lost and the EPO revoked the Neem patent. You will see a number of Neem-based personal products sold in natural/health food stores not just in Asia but also in the US and the UK. Nutrition: Serving size: 1 tablespoon. Nutri-label values will be tiny since Neem in any form is used in teaspoon quantities. Consequently, all nutrient numbers will have little meaning. But believe it. It packs a punch! A little goes a long way. Back to "Herbs and Spices"